When I came up with the idea to dress my ratties my husband thought I had lost it for sure. Now, even Deron has to admit, the ratties really are cute dressed in their little outfits and costumes. These little dresses are made in a variety of ways. 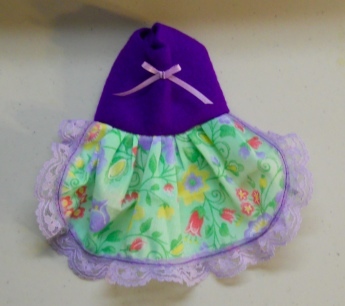 This one is a cute Flower Print with a Purple polar fleece top complete with a little Lilac bow and Lilac lace trim. Please measure your rattie before ordering these items. Each item may be of a little different size as they are all hand made, and every rattie is built a bit different. I try to change sizes a bit so that every rattie can have a new outfit to show of in. The waist measurement on this Dress is approx 7 3/4", it does have a bit of stretch in it, and the outfit is approx 6" from neck to tail. These items are new and have never been worn by or tried on by any rattie. Our outfits are designed and handcrafted in our non smoking home. The items are non returnable and not refundable. If there should be a craftsmanship error I will replace it with as close to the same fabrics as I possibly can.